Dhaka, 29 August, Abnews: A Myanmar government spokesman on Wednesday rejected a report by United Nations investigators that called for top generals to be prosecuted for genocide, saying the international community was making ‘false allegations’. His comments came a day after the UN report, which marked the first time the organisation has explicitly called for Myanmar officials to face genocide charges over a brutal crackdown on Rohingya Muslims last year. 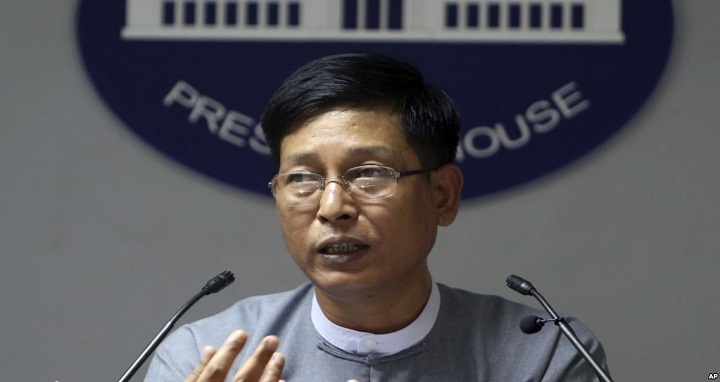 ‘Our stance is clear and I want to say sharply that we don’t accept any resolutions conducted by the Human Rights Council,’ Zaw Htay, the main government spokesman, said in an interview published in state media. He added that the country has ‘zero tolerance to any human rights violation’ and had set up a Commission of Enquiry to respond to ‘false allegations’ made by the UN and ‘other international communities’. Authorities earlier this year set up a panel comprised of two local and two international members – Filipino diplomat Rosario Manalo and Kenzo Oshima, Japan’s former ambassador to the UN - to investigate human rights abuses. ‘If there is any case against human rights, just give us strong evidence, record and date so that we can take legal action against those who break the rules and regulations,’ Zaw Htay said. The same day as the UN released its report, Facebook shut down the account of army general Min Aung Hlaing and other top military officials, accusing them of using its platform to spread ‘hate and misinformation’. In the interview published on Tuesday, Zaw Htay said the government had not ordered the ban and was questioning Facebook about the action, saying it had caused ‘mounting criticism and fear among the people’.